A new stat-boosting item will be coming to Heroes with the next update: Dragonflowers. Dragonflowers let you directly increase a hero’s stats. There are four different types of Dragonflowers: Red for Infantry, Green for Armored, Yellow for Cavalry, and Blue for Flying. For the majority of heroes, Dragonflower use is capped at five times per hero. 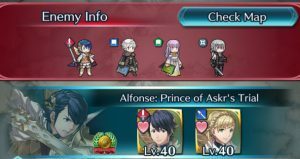 However, infantry heroes released before the 3.2 update will be able to use Dragonflowers ten times each. Stats gained from Dragonflowers will not affect Arena matches or scoring. There will be two primary ways to earn Dragonflowers: Aether Raids and Heroic Ordeals. Aether Raids we all know, but Heroic Ordeals are a new map type that will also be released with the 3.2 update. A specific Heroic Ordeal will be released for every hero that has come out in the game. You’ll have to beat the map using that hero (primary hero) and one other hero of your choice. Based on your performance in the map, you’ll earn Dragonflowers as a reward upon completion. You’ll need to defeat two or more enemies with your primary to qualify. Furthermore, you’ll earn more Dragonflowers the sooner you beat the ordeal compared to the hero’s release date. As originally teased last month, the Merge Allies function of the game is being changed and expanded. Starting with the 3.2 update, the first time you merge a hero, you will get additional stat boosts. For a hero with an Asset/Flaw, the increase will effectively cancel out that hero’s flaw. Neutral heroes will instead gain other stat boosts based on the hero. This change will be retroactive, so any heroes you’ve already merged will get an increase in stats once the update goes into effect. Additionally, to make this system a bit more transparent, Heroes is adding an option for players to be able to easily see a hero’s Asset and Flaw directly on the game screen. You’ll be able to see a hero’s Asset or Flaw by tapping on the stats in question. 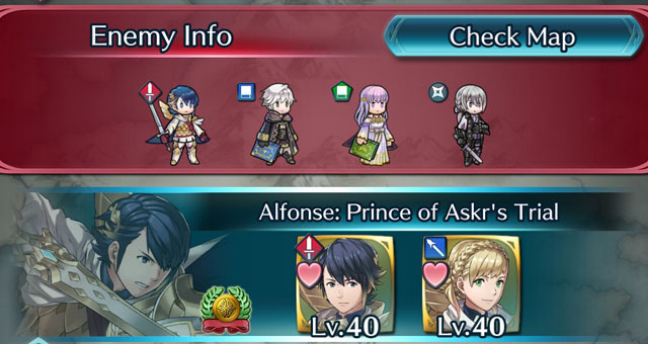 Furthermore, as seen in the screenshot above, Heroes is adding an option for the Asset/Flaw stats to be immediately visible always, with Assets appearing in blue and Flaws in red. You’ll be able to toggle this setting on and off in the Options menu. A number of updates are also coming for the Aether Raids game mode. First of all, more tiers are being added to the higher end. Serious AR players will be able to fight their way up to Tier 22 through Tier 27. Players who reach these extra tiers will be reset to Tier 21 at the end of the season. Additionally, Aether costs are being adjusted. Instead of every player getting a free battle each day, Aether costs will be significantly lowered. The cost will be halved from its current cost, and it will also cap at 50 Aether. The amount of Aether gained from destroying resources will also be halved. Finally, two popular defense maps, Spring Breeze and Lava Floes, will be nerfed. The terrain of these maps will be altered to give the attacking team a bit more of an advantage. To accommodate for these changes, the upcoming seasons for Aether Raids and Arena will be shortened. The current season has been extended and will last up until the update goes live on 7 February. The following season will be a shorter season, lasting until the usual Tuesday season change time on 12 February. A whopping eight characters will be involved in the next set of Weapon Refinery Updates. Additionally, Eliwood‘s Durandal will be able to be further upgraded in the weapon refinery. Cecilia: Festive Instructor and Laegjarn: New Experiences will both be added to the Heroic Grails pool of heroes. Brazilian Portuguese will be added as a language option. More exclusive staves will be added to Mini Units in the Catalogue of Heroes. IS: “Now Seth will be a viable unit” (proceeds to give him ruby sword with tactics defence). I just promoted Eliwood because I had nothing else to do, so I’m glad he’s finally receiving a refine. Awesome refines, been using Nino since Day 1 and IS finally decides to give her an upgrade. Not that she needs it, but I am intrigued. I have no idea how they could actually make me want to not use Blazing Durandel over the new refine on Eliwood, though. Woo, Nino and Amelia getting new weapons!